A Volkswagen employee wipes down the sides of cars as they pass her on the assembly line at the Volkswagen Assembly Plant in Chattanooga. Note to readers: In the second day of our series on economic development subsidies, we examine how Tennessee's auto industry has benefited from hundreds of millions of dollars in taxpayer support. A partnership of the largest media companies in the state examined those and other subsidies to answer a simple question: Are they good investments? Today, we also provide some lessons from other states and experts' opinions on how to improve economic development in Tennessee. This project was produced in partnership with the Ravitch Fiscal Reporting Program at the CUNY Graduate School of Journalism. Chattanooga's Volkswagen plant has received more than $800 million in federal, state and local incentives in the past decade, making it the most richly awarded business ever in Tennessee and one of the biggest among U.S. automakers. Backers of the German car maker insist the investment is paying off, projecting the plant and its recent expansion should generate more than 22,000 jobs through its own 3,400 workers at the factory, suppliers to the facility and ripple effects in the economy. 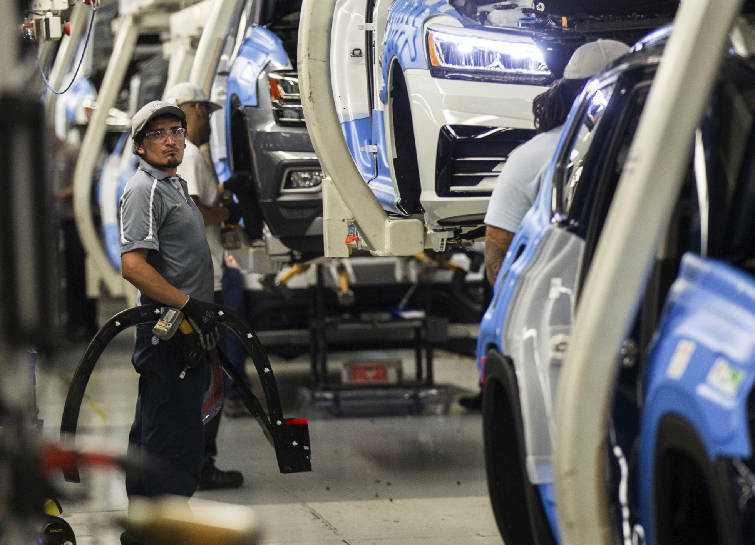 State economists estimate VW's initial $1 billion investment in the plant spurred 12,400 jobs, and last year's $900 million expansion should add another 9,799 posts in Tennessee. But critics of the tax breaks and business subsidies contend it isn't government's job to provide taxpayer dollars to private companies and they question whether state and local governments couldn't have negotiated a better deal to protect the interests of their citizens. "We agreed to give them the sun, the moon and the stars, when perhaps the sun and the moon would have been enough to ensure their location," said Helen Burns Sharp, founder of the citizens group Accountability for Taxpayer Money in Chattanooga. When Volkswagen announced in 2008 it had picked Chattanooga for the new assembly plant, some officials said it would change the region's economy and spur employment and investment gains across Tennessee. Then-Tennessee Gov. Phil Bredesen called VW "an absolute first-class, gold-seal company" and said landing the factory gave the state "a hunting license" to attract supplier jobs. Matt Kisber, Bredesen's commissioner of economic and community development, said economic recruiters from Alabama thought they had secured the VW plant for Huntsville only to be ultimately outbid by Tennessee. "We knew we couldn't match the upfront check that Alabama was willing to provide, so we went to work to figure out how we could team up with Volkswagen to help them and us succeed," he said. Eventually, Tennessee pitched the richest incentives package in the state's history. The $554 million in incentives offered to VW in 2008 equaled $277,000 per direct job created by VW. Seven years later, state and local officials agreed to another $260 million of incentives for 2,000 more jobs to build a new sport utility vehicle, or $130,000 a job. 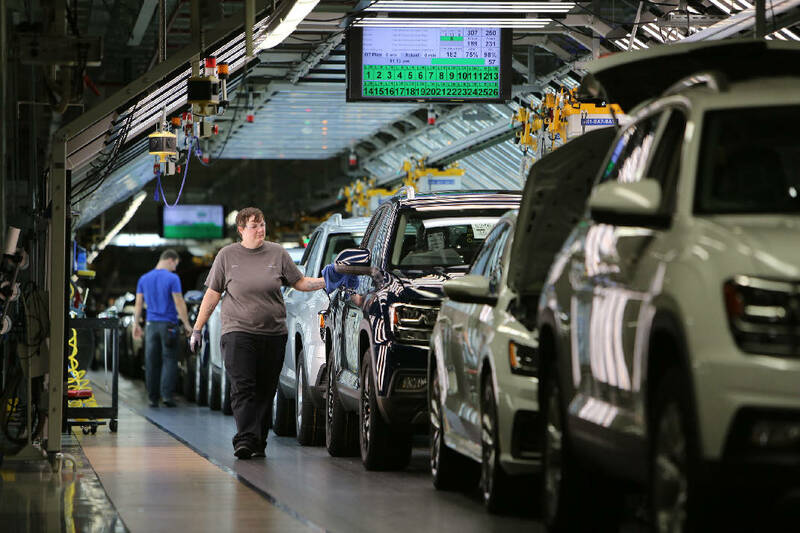 But the jobs at the Volkswagen plant were only a small part of the economic gains for the region, according to studies by University of Tennessee. The studies said VW spurred more than 12,400 direct and indirect jobs through 2012 and VW's expansion completed late last year should ultimately add nearly 10,000 more jobs, bringing the average incentives for all VW-related jobs to $36,668 per job. "Automobile manufacturing tends to have the largest economic multiplier of any industry because of all of the supplier and other spinoff jobs an assembly plant generates," said Bill Fox, director of the Center for Business and Economic Research at the University of Tennessee. "In each of the three major auto plants we've studied in Tennessee — at Nissan in Smyrna, General Motors in Spring Hill and Volkswagen in Chattanooga — the economic benefits have actually exceeded our initial projections and overall these plants have been a key source of growth for the state." Staff File Photo by Dan Henry / Motorists travel the private Ferdinand Piech Way that leads to Volkswagen's supplier park. State road builders are working on the last section of a public highway that will directly connect I-75 with Highway 58 through the VW plant site. But the road hasn't always been smooth for VW. Sales of the midsize Passat sedan, which is made in the plant, have fallen in recent years as consumer tastes shifted to trucks and SUVs. Also, a pair of rough-and-tumble union elections at the factory spurred political and labor battles, and VW's diesel emission scandal hurt the brand and its sales in the U.S.
Volkswagen's initial manufacturing entry into the United States a generation ago in Pennsylvania ended after only a decade when VW shut down its only U.S. production plant. Good Jobs First, which tracks the growing use of government incentives for private investments, said the era of the megadeals began with the $100 million incentives package offered to Volkswagen in the 1970s to persuade the automaker to build its first U.S. assembly plant. The former Chrysler plant initially had more than 5,000 jobs when it opened in 1978, but within a decade the factory shut down after Volkswagen suffered heavy losses. 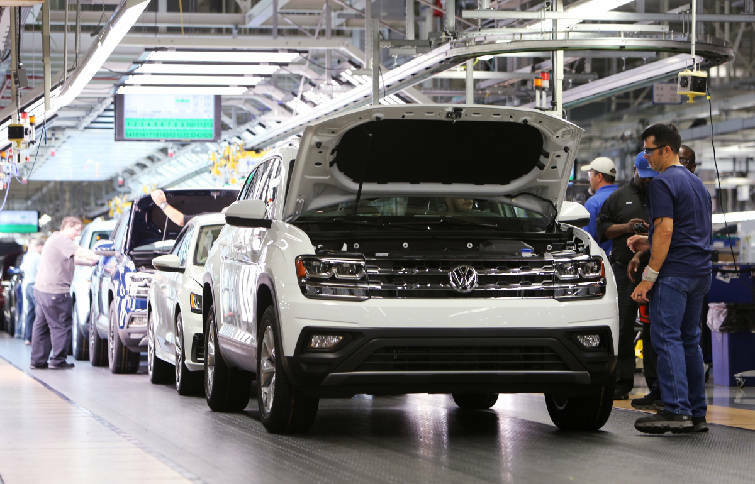 VW is still yet to turn a profit on its Tennessee plant, but the company earlier this year ramped up assembly of the new midsize Atlas SUV at the factory, sharply boosting its employee headcount. Volkswagen employees work around vehicles moving down the assembly line at the Volkswagen Assembly Plant Thursday, Aug. 31, 2017, in Chattanooga, Tenn.
For some employees at the plant, coming to work for the automaker in Chattanooga changed the course of their lives. Krista Condor recalled she was laid off from her job at a marine company in North Georgia in the aftermath of the Great Recession and out of work for six months before she joined VW in January 2010. "I do remember walking out of the door [at her old job] and saying 'I'm going to work for Volkswagen,'" she said. Condor, 49, lives in Calhoun, Ga., and drives about one hour each way to and from VW as a senior electric engineer. She likes that she has helped grow the automaker's presence in Chattanooga essentially from the ground floor and she works at a place with a lot of career potential. "I liked being part of something new," Condor said. "I like to learn." VW employee Stephen Warrick lived in the Detroit area working for Chrysler when the Great Recession hit nearly a decade ago. "I didn't get laid off, but at the end of 2008, it offered a management buyout program," he said, adding that no one really knew then if Chrysler would survive the sharp downturn. Warrick, 35, joined VW in Chattanooga, where he saw job security and a commitment to the factory from the automaker and the area. A senior manager for the product line, he said he recently returned to Chattanooga after a multi-year assignment at VW's headquarters in Wolfsburg, Germany. "To me, it has been a really great opportunity to grow as an individual," Warrick said. "Though we operate locally, VW has a global network and reach. What's been interesting to experience is the globalization of Chattanooga and bringing that international flair to the city." Roger Hyler, who oversees the "car surface team" at the plant, joined VW in September 2011 after a stint in the military and soon found that he "was made for this." Hyler, 33, added that he met his wife, Lisa, at the plant. "When I started out, I was put on special projects. She worked in logistics. She found me on social media. I asked her out. It was over from there," he said. "I was looking for something stable, a home for my family," he said. "From a career path, you can go as far here as you want." While VW employees may enjoy their jobs, critics of the tax breaks and payments given to Volkswagen contend other workers are paying the price for the automaker's benefits. "Is there any situation in which government gives taxpayer dollars to a company? We'd say no," said Mark Cunningham, director of communications at the Beacon Center, a Nashville-based advocacy group opposed to what it calls government handouts and bailouts. Even if some people maintain there's a role for incentives, he asked how much a job is worth? "What is a good deal compared to a bad deal?" Cunningham asked. Sharp said she thinks the tax incentives given to VW were warranted but "overly generous." "Their location decision was one of those rare instances where subsidies may have tilted the scales because the company may have had two equally compelling choices," she said, referring to the fact that Huntsville was a finalist to host the plant. But Sharp noted that under its agreement with the city of Chattanooga and Hamilton County, Volkswagen won't pay any property taxes other than for schools for 30 years and the original agreement did not require VW to meet any specific job or investment reporting standard. She said the jobs language is "weak," even though the city and county agreed to provide $52.5 million in grant money for the expansion project. However, Chattanooga Mayor Andy Berke said the benefits from the VW plant "have far exceeded the costs" of the tax breaks, incentives and infrastructure and training investments. 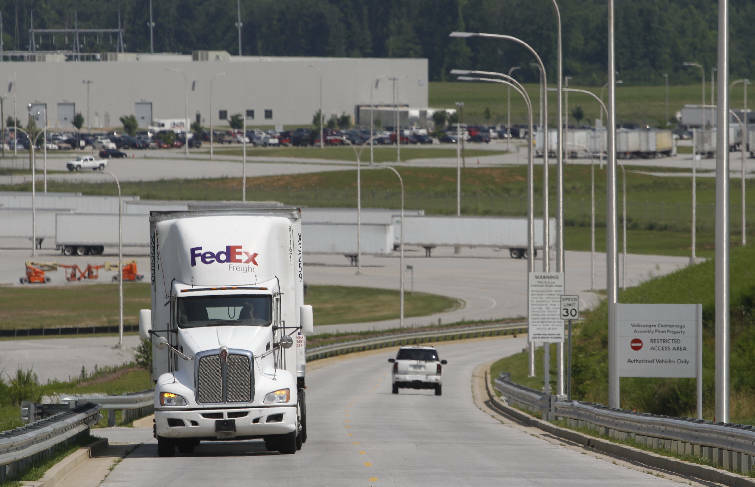 "The downstream effects from an auto plant are huge, so we expect just the expansion we worked on will add more than 10,000 jobs, which is extraordinary for a city our size," he said. Berke said VW didn't get everything it wanted, calling the negotiations with the automaker "tough and spirited" and not finalized until the last minute before the deal was announced. The initial UT study on the plant's impact estimated the new jobs created $643.1 million annually in income. Also, each year, Tennessee receives $31.2 million in added revenue, while local governments in Tennessee receive $22.3 million in additional revenue related to the project, the study said. The second study related to the expansion showed the new jobs will be responsible for $372.6 million in new income annually, once fully operational. Additionally, state and local governments will see an injection of $35.1 million of new tax revenue per year as a result of VW's expanded operations. Contributed photo / Volkswagen assembly workers in Chattanooga inspect vehicles at the Enterprise South industrial park production plant. The Volkswagen incentive package is just part of the billions of dollars in tax breaks, investment credits and outright payments Tennessee governments have provided foreign-based companies to come to Tennessee. By rolling out the red carpet to businesses around the world, the Volunteer State has ranked first in recruiting direct foreign investment in two of the past three years, according to IBM's Global Location Trends analysis. "We compete in a global market for jobs," Tennessee Gov. Bill Haslam said. Wacker, based in Germany, which got $210.5 million in incentives in 2009 for 500 jobs at its polycrystalline silicon plant in Charleston ($421,000 per job). That was still only about half of the $479.4 million of incentives offered in 2009 to Hemlock Semiconductor (controlled by Dow Corning) for a similar polycrystalline silicon plant in Clarksville that closed before production started. Electrolux, based in Sweden, which got $210 million in incentives in 2010 for 1,240 jobs at an appliance production plant in Memphis. Bob Rolfe, Haslam's chief economic recruiter, said workers don't care where their employer is headquartered, just where they can find the best job. 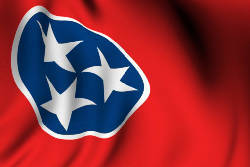 "We are eager to sell Tennessee all over the world," Rolfe said. Gary Farlow, who heads the Cleveland-Bradley County Chamber of Commerce, said both VW and Wacker are "game-changers for this region." Wacker, he said, eventually put $2.5 billion into the plant, the biggest single manufacturing investment in Tennessee, along with 650 jobs. Also, it recently announced a $150 million expansion and 50 more jobs. "I think the money was well-spent," he said about the incentives. But Tim Price, owner of JAT Systems in Soddy-Daisy, criticizes such incentives as unfair, noting that most of the government aid goes to big companies or those who are not already in the state. "It's just not fair to small business owners like me who have to pay more in taxes so that Volkswagen doesn't," he said. "They are picking winners and losers with these incentives and that's inherently political and it's not right." However, Bruce Trantham, co-owner of Chattanooga-based logistics and warehouse company Tranco Global, said he has been able to seize "a sizable piece of business" related to VW. About the tax incentives, he said, "They're absolutely worth it. How much in taxes were we getting before they came?"